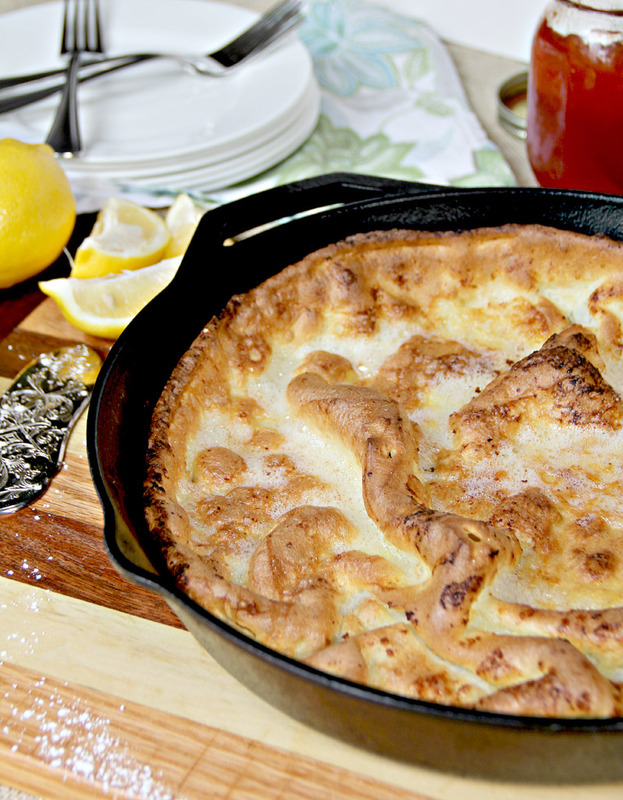 Dutch Baby Pancake - Quick and Easy! 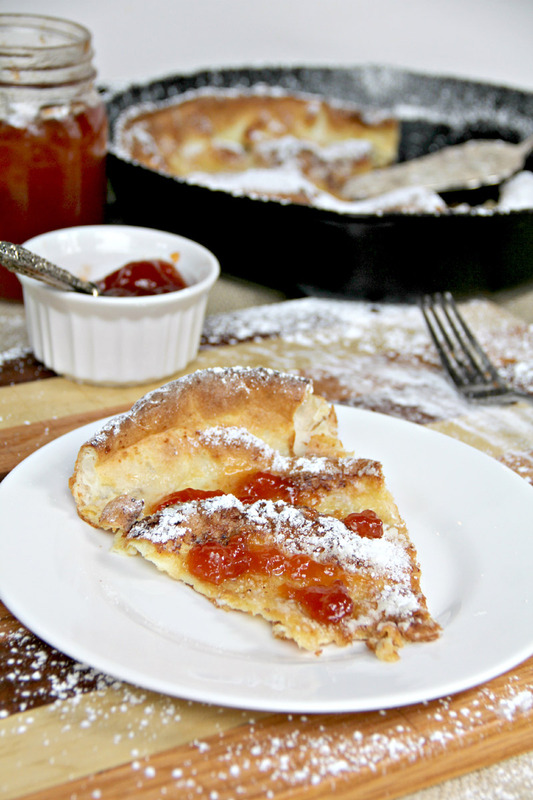 Dutch Baby Pancake is light, fluffy, and delicious with a sprinkle of powdered sugar or a bit of jam—and best of all, it’s quick and easy! Have y’all ever made a Dutch Baby Pancake? I had not, until this morning. We will have a house full with our kids this coming weekend, and I was trying to come up with something different to fix for breakfast. I’ve seen recipes for a Dutch Baby Pancake in magazines and online but never tried it. I always figured it was complicated and since I’m not a morning person I tend to stick with uncomplicated or Do-It-The-Night-Before recipes, like my Baked French Toast Casserole with Streusel, or Breakfast Casserole, or Orange Croissant Breakfast Casserole. But when I started paying attention to what’s involved, I realized that the recipe for Dutch Baby Pancake is just about the easiest thing ever. Ever. There are multitudes of recipes and versions out there for a Dutch Baby Pancake, but I tried this one from David Eyre, which originally appeared in the New York Times in 1966, and which, according to Wikipedia, was based on a German recipe from the 1919 edition of Victor Hirtzler’s Hotel St. Francis Cookbook. If a recipe from 1919 is still hanging on and has made it to the blogosphere then it must be good, right? According to Martha Stewart, Eyre’s recipe makes a pancake that is “a more delicate version of the classic puffy German pancake,” but that’s fine with me. I like this delicate version. 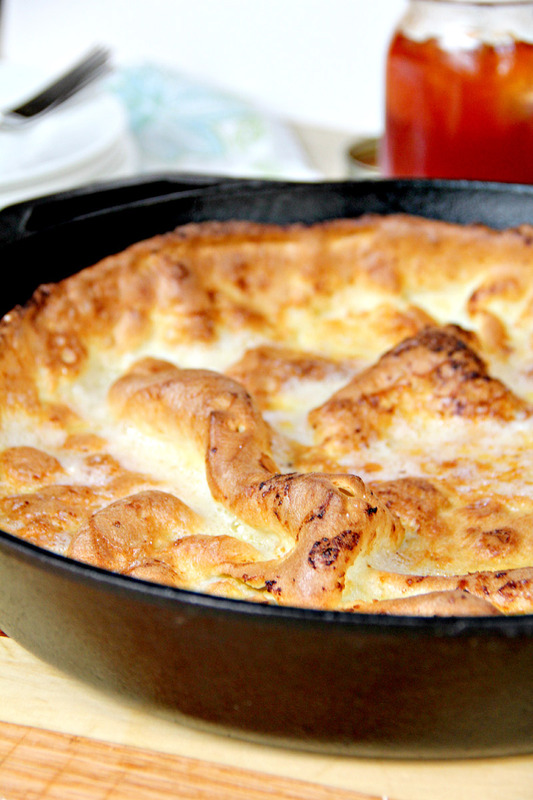 This Dutch Baby Pancake is so light it’s almost ethereal. There’s just enough crispiness around the edges with a slight softness in the center. And I didn’t change a thing other than adding a dash of salt. It’s really perfect just as it is. I did try to double the recipe but didn’t like the way that version turned out. If you’re serving more than 5 I would suggest simply making two pancakes. It’s so easy that making two would really be no trouble. You’re mixing flour, milk, nutmeg, and eggs, and pouring the scant amount of batter into a hot skillet filled with melted butter. Then into the oven for about 20 minutes. That’s it. That is really all that’s involved. You’ll pull this puffy, golden, beauty of a pancake from the oven, squeeze a little fresh lemon over it and sprinkle it with powdered sugar. You can add toppings if you’d like: I added a little of my Mama’s homemade plum jelly and that was perfect. 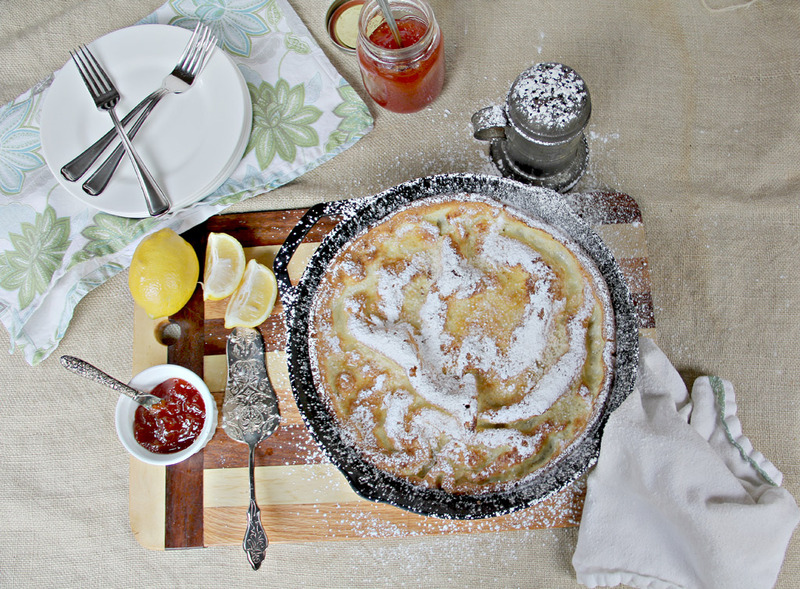 Enjoy this Dutch Baby Pancake with your family! 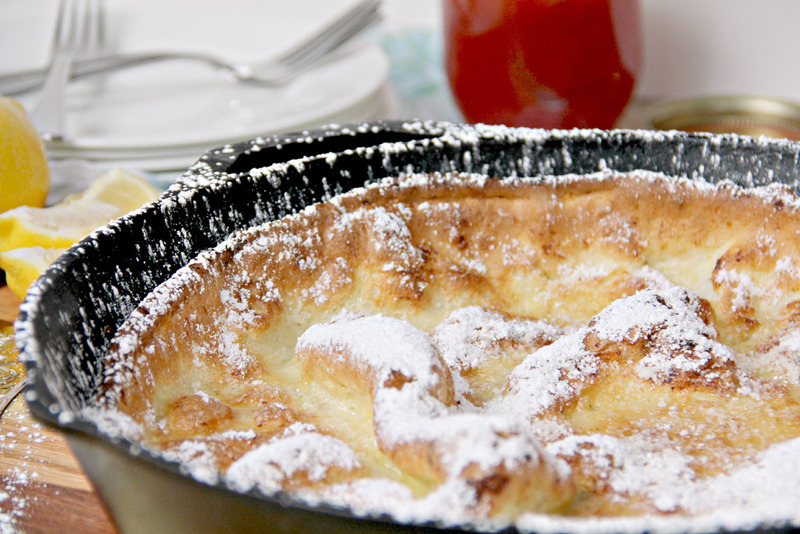 A delicate Dutch Baby Pancake that's light, quick, and easy and works for breakfast or dessert. Heat oven to 425. Place butter in 12-inch ovenproof skillet and set in oven to melt the butter. Skillet should be hot when you pour in the batter. In medium mixing bowl, combine flour, milk, eggs, nutmeg, and salt. Whisk until blended but don't over mix. Pour batter into hot skillet. Bake 15-20 minutes, until pancake is puffy and deep golden brown. Remove skillet from oven. Squeeze lemon over pancake and then sprinkle with powdered sugar. Serve immediately with your favorite jam or preserves. You can mix up the batter the night before and leave it in the refrigerator until ready. Allow the batter to come to room temperature before using. Recipe very slightly adapted from David Eyre’s Pancake recipe featured on Food52.com.